Basic is best - You rabbit food should be a blend of pellets, hay and greens. We all know that it’s important to eat right if we want to be healthy people. It’s just as important for you bunny to eat right if you want your furry friend to have a long, healthy life. 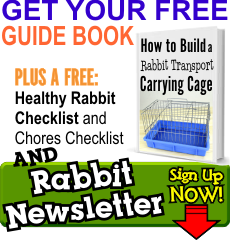 Keep reading for a great guide on how to pick the right food for your rabbit. Rabbits are vegetarians, so their diet should be a base of really high quality plant foods. In nature your pet bunny would forage all day on grass, weeds and other leafy plants so we want to replicate that diet as much as possible for their “home life”. 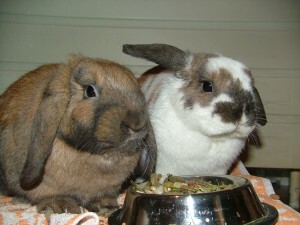 Start by selecting a rabbit food that is hay-based (like timothy hay). Try to avoid alfalfa based rabbit food (read the label on the bag and it will tell you what’s in it) – these foods tend to be high in protien and calories. I don’t like foods that have little bits of dried fruits and veggies all mixed in (I like to give my own treats! You can see some recommend homemade treats here or check out some all natural pre-made treats) and the extra high-calorie chunks can lead to unwanted weight gain. Some rabbits will also get into the habit of just picking out the bits they like best and will miss out on important nutrition by selective eating. Organic food is always a good choice – you know that it has less chemicals (what’s good for me is good from my bunny) and I always try to find the freshest food possible. If you’re buying in a store look for the “best buy” date to get super fresh food. Fiber: Rabbits need a high fiber content in their pellets to have a healthy gut. Look for at least a 16% minimum, ideal is 18-20%. Protein: This will vary depending on the age of your rabbit. Young rabbits that are still growing need a protein content of about 16%. 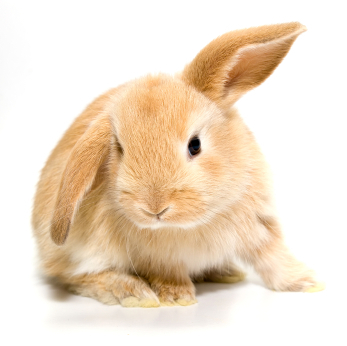 Adult rabbits should have a protein content of 12-14%. Other Stuff on the Bag: Most bags will also have an Oil and Calcium listing. As long as your Oil is not over 10% and your calcium is around 0.2-1% you’re looking good! A rabbit should also be fed a good supply of fresh greens and grass-based hay (like timothy or Bermuda hay) as part of a healthy diet. Greens can include spinach, kale, sprouts and mustard greens. The only greens I stay away from is iceberg lettuce (its too watery and not very nutritious) and anything spicy (like radishes and pepers). Be sure to wash everything before feeding to your bunny! Of course, you’ll need to know how much food you should be feeding your rabbit so keep reading or hop on to more advanced info on our Beyond Basics page.